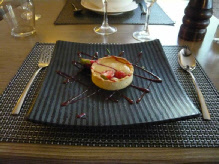 St Omer Restaurant Wins New Award! You never forget your first kiss, they say, nor the birth of your first child. Well we have another first to add to this list – your first GPS sat-nav destination. When we took delivery of our new car last week we couldn’t wait to try out the built-in sat-nav. Fiddling about with the buttons, we found the system included a facility to indicate all manner of useful places like Hotels, Petrol Stations, Hospitals and Garages, and amused ourselves by getting it to find restaurants. Each establishment was indicated by an appropriate symbol representing the type of cuisine. The national flags for French or Italian food, a plastic-looking hamburger for McDonalds, and so on. You just touch the symbol on the screen for details of the restaurant and touch another to set it as your destination. And so it was we rediscovered the Moulin de Mombreux, a restaurant we used to visit in the 1990s when we were still living in London. In those days it had one Michelin star, lost, we assumed, sometime in the intervening years. I remember dining there once with a couple of friends when I overheard a French diner at a table nearby remark to the proprietress, in a rather surprised tone, that he noticed she had a table of British customers. “Oh, yes”, she responded, “some English tourists even seem to know a bit about good food and wine, these days”. Clearly, however, neither of them imagined a mere Anglais would be able to understand their French conversation. Our new sat-nav guided us gently and swiftly to our first destination. In fact, this is not an easy place to find without some kind of navigational aid. Not far from an ugly cement factory and down a lane that appears to go nowhere, we were beginning to think the place had disappeared or closed down, when suddenly we glimpsed it hidden among trees by a pretty river. There are two buildings, one modern, housing the hotel rooms, and an old attractive watermill where the restaurant is situated. We decided to eat in the Bistro du Moulin rather than the more expensive restaurant itself. The bistro is on the ground floor. It’s comfortable but a little gloomy. The well-preserved wooden shafts and gears of the millwheel are prominent on one side of the room, but the small windows don’t let in a lot of light, and there are none on the side facing the river. 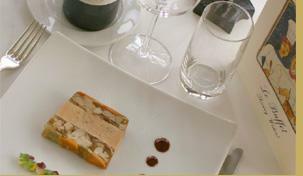 The Bistro menu is very moderately priced at 13€ for three courses with coffee (2009). For a couple of euros less you can have either a starter and main course or a main and dessert. We chose to have all three with a glass of wine each and some water. 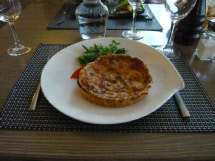 Our starters were a dainty Terrine de St Jacques, small but delicious, and an unexpectedly large Tartelette Savoyarde, a pastry flan of potato, cheese and lardons. Both starters were nicely presented with a little salad for decoration. To follow, my Fricassee de Vollaille au Sirop de Coing was excellent, the meat dark and moist with a rich, unctuous sauce. The Nage de Poisson et Raviole d’Ecrevisse arrived tepid at best, and had to be sent back to the kitchen to be heated up. This was a pity, as everything else about the meal showed a careful attitude to preparation and presentation. Our desserts, Tarte du Jour (Chocolat Blanc), and a dish of various ices were both prettily presented and equally delicious. 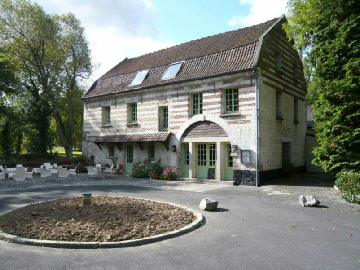 The bill was only 33 euros for the two of us, so after the briefest possible debate, the judges unanimously awarded the Moulin de Mombreux the grand honour of “First Destination” to be stored in our gleaming new car’s sat-nav. Frogsider Blogs is re-publishing some of the best articles and reviews from the Frogsiders Magazine pages, which are to be gradually phased out over the next few months. and his charming front of house wife Christine, who ensures everything runs smoothly, at this elegant and excellent restaurant, which is housed in the former station restaurant, hence the name ‘the Buffet’, opposite Molinghem railway station, Isbergues, near Aire sur la Lys on the borders of Flanders and Artois. a village in the region which is renowned for the quality of its fowl; fresh scallops from Boulogne; fresh fish from the Cote d’Opale; vegetables from the market gardens of Saint-Omer; and wines from the Delepine cellars in Liettres. As the Wident’s say in their ‘blurb’: ‘Why have an ordinary day when you can have a festive one?’ Indeed, why not! You will not be disappointed. My wife and I have dined at this restaurant a number of times over the past few years, having been first introduced to it by some foodie friends, and have been impressed by the consistency of the quality, inventiveness and presentation of the cooking. After all, you eat as much with your eyes as with your taste buds! 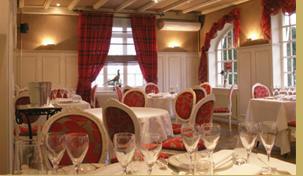 Apart from the ‘a la carte’ menu, there are several set menus to choose from, which are changed to reflect the seasons. On our last visit, Christine had the aptly named ‘flavours and surprises’ four-course menu and I had the three course ‘winter delights’ menu. Christine had turbot for her main course and I had chicken from Licques. Both dishes were served with delicious sauces and fresh seasonal vegetables, which were cooked to perfection. Generally speaking, unlike the English, the French are not usually good at cooking vegetables – or even serving them! with a large selection of cheeses from here and there, including some local goats’ cheeses and maroilles. The deserts were delightful: a rhubarb-based creamy one for me and Thierry Wident’s signature and award-winning desert of spiced biscuits and mousses with caramel ice cream for Christine. Following an old Spanish custom, we each tasted one another’s and declared them ‘impeccable’! We downed a half bottle of 2007 Chablis and a bottle of 2006 Cotes de Rousillon. 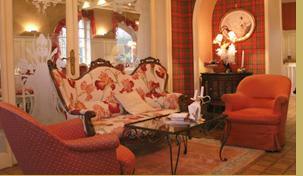 Le Buffet has a very fine selection of French wines to choose from to suit all tastes and, of course, all pockets. To try some of their very best wines, we really do need to win the Euro Lottery – the only problem is, we never buy any tickets! And the bill came to €130 – remarkable value for such exquisite and refined cooking!